Space and teenage thieves?! I'm all in. Okay, so I wasn't totally all in at first. If that makes any sense...but Arnett managed to convince me. Hard. Science fiction isn't normally my thing. I enjoy movies like Star Wars and Star Trek, but I'm not a huge fan of reading about far off planets and space. The closest I've come to deep space reading is Cinder by Marissa Meyer. And even in that there's no actual space adventures, just the mention of moon colonies. (I totally lied. I forgot that I've read Alienated by Melissa Landers.) So I went into this book thinking I'd enjoy it, but perhaps not love it. And, for the most part, I fell somewhere in between. Why, you may ask. Well, the beginning was slooooooow. I couldn't find myself getting into it. I think I was on page 60 before I really began to get pulled in. But once I did get pulled in, I was stuck. I absolutely loved it after that! Sure, there were some minor parts I would have liked drawn out or slimmed down, but overall, I was hooked. I can honestly say that this book has an original YA storyline, which isn't something you see too often nowadays. Let's move on from all my gushing and talk about the characters a little. Jeth seemed very two-dimensional at first. I couldn't figure him out, and to be honest, I didn't really want to try. Then, something happened and I suddenly began really empathizing and loving his character. The other side characters like Sierra, Cora, Lizzie, Shady, Celeste, etc, were just too flat to me. I liked them as a group, but I'm not sure how I feel about them individually. Also, the character and setting that is the spaceship Avalon, had me a bit disappointed too. I felt like I didn't get enough of the history behind the ship. It really should have been its own fully-formed character and it just wasn't. BUT the bad guys were awesome! I don't know exactly what made them so awesome, but they were. Hammer is a douche and I loved him for it! There you go. 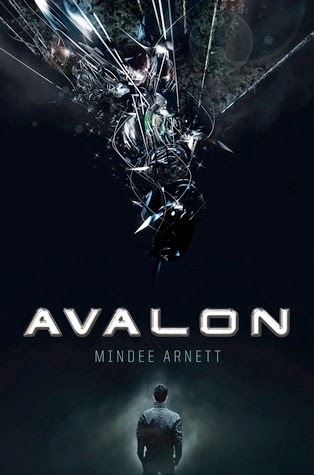 That's my review of Avalon by Mindee Arnett. I would have said I loved it, simply because once the first one ended I immediately wanted the second book, if only it didn't have so many teeny flaws. I do plan on purchasing the sequel, and I plan on thoroughly enjoying it. I would totally recommend this book to anyone who isn't sure about reading science fiction. You'll enjoy it.